Marshawn Lynch had just finished his daily press conference, and Howard Eskin’s face was the color of the stone formations at Red Rock State Park. Eskin is a handsome, Hans Gruberesque guy who does TV and sports radio in Philadelphia. He had been — to use a phrase slung around the media rooms in Phoenix this week — just doing his job. Eskin squeezed his way past reporters and got close to Lynch. He asked a question. OK, it wasn’t a nice question. Or a question that was meant to solicit an answer. “You know why I’m here,” Lynch said. Lynch didn’t answer that, either. These kinds of contretemps aren’t new in sportswriting. Russell Westbrook just did a Lynch homage during a dispute with The Oklahoman. This season, the Chicago Bears press corps found that Brandon Marshall was giving much of his best stuff to Inside the NFL. So why have the Lynch Super Bowl press conferences become an existential crisis for sportswriting? What about Lynch’s actions is so offensive? With that, Howard Eskin Beast Moded to the crux of the issue. He said what few media members are willing to admit: virtually every piece of sportswriting contains some amount of free advertising. Amounts may vary. We writers may try for good sentences, hardheadedness with the jock class, a solid foundation of stats like DVOA. But the commands embedded in our copy read the same: Watch the Super Bowl. Watch a whole week’s worth of press conferences. Drink in the drama. There are only a few things in the NFL that are better in person than they are on TV. A Lynch press conference is one of them. About 10:30 Wednesday morning, a bunch of us reporters gathered around a small table in a resort hotel off Baseline Road. A placard bearing Lynch’s name had been placed on a table. Everyone leaned in for a better view. There was no hope of information or insight, but everyone wanted to be there for the theater. Jesus. We abandoned the table and ran into the next room. We surrounded a podium just as we had surrounded the table. I felt myself shoved forward so that my notebook rings were almost poking Eskin in the neck. The mob moved forward again, driving reporters into the NFL’s logo backdrop. “This is just insane,” somebody said. Lynch got within steps of the podium and then stopped. Would he stiff the press altogether? Absorb what’s rumored to be a half-million-dollar fine? Nope. “They said there’s some steps on the other side,” Lynch said. He took a leisurely turn around the circumference of the media throng and mounted the podium. He was wearing reflective sunglasses and two necklaces with Africa-shaped medallions. He laid down his phone and gave his now-familiar spiel about not talking to the press, no matter the question. Some of the questions were poison darts. The only time Lynch got off script, Maaddi said, was when “I asked him what pregame music he listened to. He said, ‘New song. Marshawn. You know why I’m here.’” Maaddi wasn’t sure that counted as an answer. A reporter asked if Lynch had a message for the people of Brazil. Another asked Lynch if he preferred cat videos to dog videos, repeating the question Lynch obligingly answered in his new Skittles commercial. A reporter who was filming Lynch with her phone gave up and just began to wave at him. Lynch stayed for five minutes. Actually, 4:58 by most reporters’ clocks. “You’re two seconds short!” Eskin cried. But it took no more than two minutes of stonewalling for an unease to settle over the press horde. The theater wasn’t fun anymore. Patrick Finley of the Chicago Sun-Times squeezed his way out of the mob. “I’ve had enough of this,” he said evenly. “I want to talk about why I’m here,” one reporter said. It’s one thing to enjoy the theater, of course, and another to make Lynch into a Menckenesque press critic. He’s never spouted ideas like Richard Sherman, who pointed out that the NFL fines players for missing press conferences but doesn’t pay them to attend. On the one hand, Lynch just doesn’t like the cameras. “I think that you’re seeing a demonstration of a guy being himself and not being what everybody wants him to be,” Pete Carroll explained. On the other, Lynch seems annoyed by the press’s coverage of his legal troubles (reckless driving, striking a pedestrian), none of which seemed outside the bounds of normal reporting. As we saw in 2014, the NFL can turn even crime into free advertising. Indeed, Lynch’s press critique has the fuzziness of his teammate Doug Baldwin’s. After the Seahawks squeaked by the Packers in the NFC title game, Baldwin delivered an expletive-rich torching of reporters. I’m sure some writers reported Seattle’s 3-3 start this season as if ISIS had landed pirate ships in Gas Works Park. But the defending champs’ slow start was a news story. It was also free advertising. That’s why the uncritical cheering of non-speaking athletes rings hollow. It depends on the athlete. I asked Baldwin what he’d learned about the media this season. I didn’t buy that, because by Tuesday, Baldwin had done to Deion Sanders what he’d once done to print reporters. That is, he’d made Sanders a stock character in his self-motivational exercises. He’d learned to use the press, quite effectively. 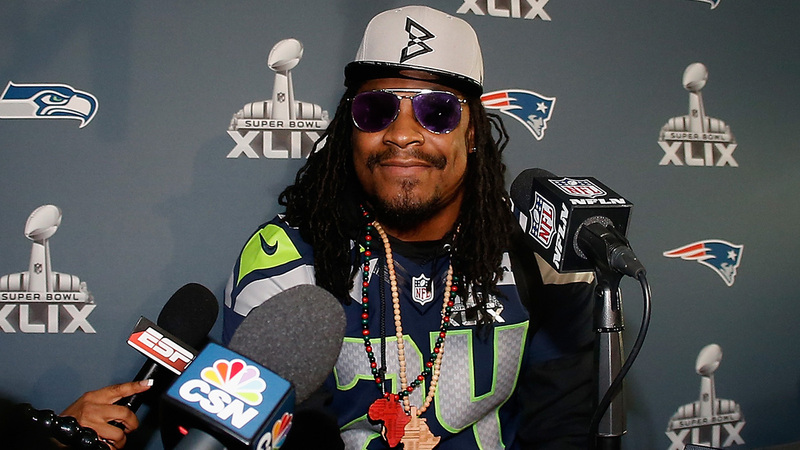 That’s an olive branch Marshawn Lynch will never extend. Through his unending silence, Lynch is telling reporters: We aren’t business partners. Together we don’t make football. I put a hypothetical to Eskin. What if along with all the “You know why I’m heres,” Lynch gave us 10 seconds of A-plus cliché. Some usable “sound,” as they say in the TV trade. Could such a miserable portion make us forget what the Lynch press conferences reveal about our trade? Ten measly seconds? “Make it 15 seconds,” Eskin said with a hearty laugh as he set off in search of a friendlier voice.